The operations below can be applied to the whole model or selected parts (e.g. "modify.selection=chain A and backbone"). See examples below. 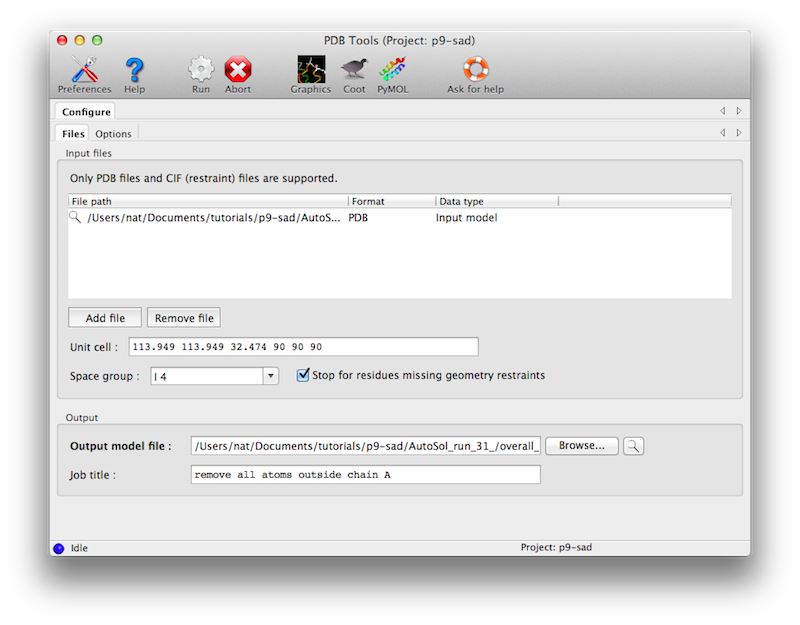 As input, only a PDB file and appropriate geometry restraints (in CIF format are required. (The geometry restraints are actually optional if you uncheck the box "Stop for unknown residues", but they are strongly recommended.) Crystal symmetry is not essential but also recommended, and will be propagated to the output model. Many different options are possible, only some of which are shown in the main window. The atom selection controls can be used to specify which part of the model will be affected by various changes, or to eliminate parts of the model. The operations on coordinates, B-factors, and occupancies also have separate (optional) atom selections. % phenix.pdbtools model.pdb remove="chain C or water"
% phenix.pdbtools model.pdb keep="chain A or chain B"
% phenix.pdbtools model.pdb keep="not(chain C or water)"
% phenix.pdbtools model.pdb remove="not(chain A or chain B)"
The result of all four equivalent commands above will be a new PDB file containing chains A and B only. Important: the commands keep and remove cannot be used simultaneously. % phenix.pdbtools model.pdb keep=water set_b_iso=25 modify.selection="chain C"
put_into_box_with_buffer = None Move molecule into center of box. change_of_basis = None Apply change-of-basis operator (e.g. reindexing operator) to the coordinates and symmetry. Example: a,c,b . truncate_to_polyala = False Truncate a model to poly-Ala.
truncate_to_polygly = False Truncate a model to poly-Gly. remove_alt_confs = False Deletes atoms whose altloc identifier is not blank or A , and resets the occupancies of the remaining atoms to 1.0.
always_keep_one_conformer = False Modifies behavior of remove_alt_confs so that residues with no conformer labeled blank or A are not deleted. Silent if remove_alt_confs is False. set_chemical_element_simple_if_necessary = None Make a simple guess about what the chemical element is (based on atom name and the way how it is formatted) and write it into output file. set_seg_id_to_chain_id = False Sets the segID field to the chain ID (padded with spaces). clear_seg_id = False Erases the segID field. move_waters_last = False Transfer waters to the end of the model. Addresses some limitations of water picking in phenix.refine. atom_selection = None Selection for atoms to be modified. Overrides parent-level selection.